An avian blizzard in central Wisconsin in 1871 made for a spectacle the likes of which would never be seen again. 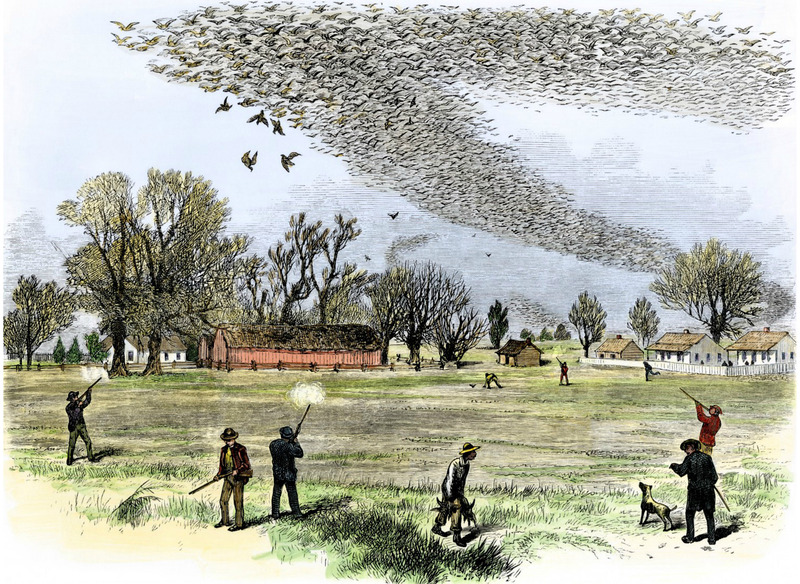 Hundreds of millions or maybe even a billion passenger pigeons made their spring nesting grounds across a broad swath of the state, with observers reported the birds carpeting trees throughout. Indeed, it was the largest nesting of passenger pigeons ever recorded. It was also a bonanza of incredible proportions, with hunters shooting and selling tens maybe even hundreds of millions of the birds for the commercial game market. Less than three decades later, the passenger pigeon would no longer be found in the state, and the species would be extinct by 1914. The disappearance of the passenger pigeon (Ectopistes migratorius) may be the most infamous example of an extinction caused by the actions of humans. Its tale is illustrative of how people can simply eliminate a once common, even abundant creature through relentless killing. Stanley Temple, an emeritus professor in the Department of Forest and Wildlife Ecology at the University of Wisconsin-Madison, shared the story of the passenger pigeon in an Aug. 20, 2014 presentation given on the occasion of the centennial of the bird's extinction. Delivered as part of the Wednesday Nite @ the Lab lecture series on the UW-Madison campus, his talk was recorded for Wisconsin Public Television's University Place. Over several decades following the Civil War, vast and continuous hunts of passenger pigeons for meat and live specimens drove the species to extinction. "You really don't need to be a population biologist to figure out if you're killing these birds on an industrial scale and preventing them from reproducing, extinction becomes a mathematical certainty," said Temple. Martha was the name of the endling passenger pigeon. She was on exhibit at the Cincinnati Zoo for years before dying on Sept. 1, 1914. The bird's body was subsequently sent to the Smithsonian Institution in Washington, D.C. for study and preservation. A taxidermy mounting of Martha has since been displayed at the National Museum of Natural History and other institutions. 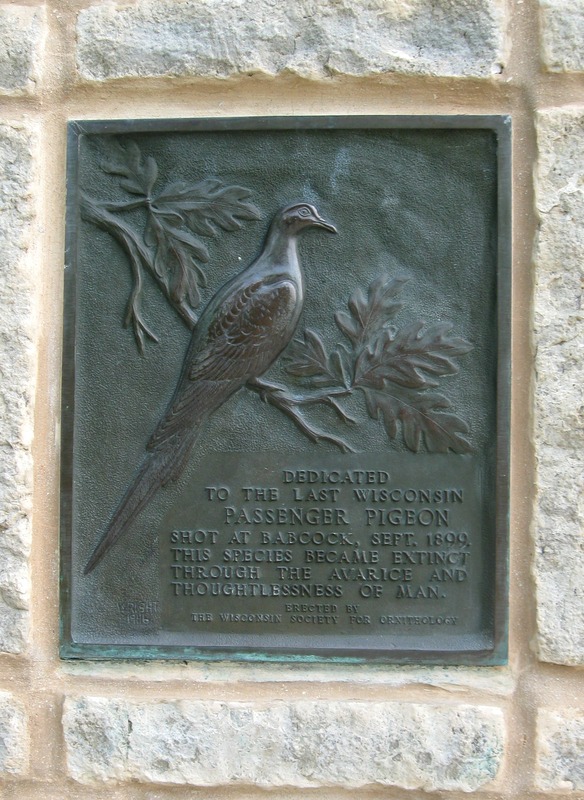 In 1947, the Wisconsin Society for Ornithology placed a monument to the long-gone passenger pigeon at Wyalusing State Park, on a bluff overlooking the confluence of the Wisconsin and Mississippi rivers. It reads: "Dedicated to the last Wisconsin Passenger Pigeon shot at Babcock, Sept. 1899. This species became extinct through the avarice and the thoughtlessness of man." Its placement was dedicated by Aldo Leopold and memorialized in his essay "On a Monument to a Pigeon," which was included in A Sand County Almanac. "It was, indeed, a very remarkable event," said Temple. "It was the first time that any sort of public sort of grieving, mourning over the loss of a species that we had clearly caused to go extinct had ever taken place." In 2014, Project Passenger Pigeon was launched to commemorate the centennial of Martha's death and the species' extinction, with Temple playing a leading role in Wisconsin and around the nation. This ongoing educational campaign highlights the bird's legacy and encourages sustainable practices to prevent the extinction of other species. Its work has included books, the documentary From Billions to None: The Passenger Pigeon's Flight to Extinction, lectures, artistic projects, and in southern Wisconsin, a rededication of the Wyalusing monument and the limited release of Passenger Pigeon IPA by Capital Brewery. At the beginning of the 19th century, biologists estimate that there were about 3 to 5 billion passenger pigeons living in their home range of deciduous forests around eastern North America, making it the most abundant bird on the continent, and perhaps in the world. Flocks of passenger pigeons would travel continuously in search of mast (primarily acorns and beechnuts) and eat their fill before returning to wing, hence the name. They would briefly halt for about a month during nesting season in a range that included most of the lower Great Lakes region. Pigeon pairs would lay a single egg, and abandon their hatched squab about halfway through its development, while gorging all available food until compelled to move on in search of more. Records gathered by 19th century naturalists provide the basis for most of the information known about the numbers, range and behavior of passenger pigeons. Alexander Wilson, an early Scottish-American ornithologist, documented the birds, as did John James Audubon, who remarked on their flocks darkening the skies for days. John Muir remarked on observing the birds' passage as a young man growing up near Portage. Hundreds of places around the eastern half of the U.S. are named for passenger pigeons, often by settlers who were impressed by the passage of a colossal flock. In Wisconsin, there are well over a dozen places named for the birds. For example, the Waupaca County community of Clintonville was originally named Pigeon, and the river that flows through it still bears that name (as does a namesake brewery based upriver in Marion). Another Pigeon River rises in Manitowoc County and flows through Sheboygan County before emptying into Lake Michigan. There's also the village of Pigeon Falls and town of Pigeon, both in Trempealeau County. Native Americans and settlers around eastern North America regularly hunted passenger pigeons, with the appearance of their flocks virtually guaranteeing a bounty of fresh meat for a brief period. But due to the birds' continuous traveling, this mode of hunting did not significantly reduce their numbers. After the Civil War, a national market developed for passenger pigeon meat and live birds. Aided by rapidly growing networks of telegraphs and rail, commercial hunters would follow flocks and continuously harvest birds. The hunt was particularly intense during nesting season, when both adults and squabs would be killed in immense numbers. U.S. Census data from the late 19th century indicates that there were likely tens of thousands of people who listed "pigeoner" as their occupation. The largest passenger pigeon nesting on record was in 1871 across an 850-square mile swath of central Wisconsin that stretched in a "V" shape from Black River Falls south to Wisconsin Dells and back north to Wisconsin Rapids. Hundreds of millions of pigeons, perhaps even as many as a billion, nested throughout the area. About 100,000 commercial and other hunters flocked to Wisconsin, killing many tens of millions, perhaps hundreds of millions of birds, shipped on ice in barrels that were loaded onto trains headed to market in cities. During the hunt, one gun dealer in Sparta sold 512,000 rounds of ammunition. Along with killing meat, pigeoners would capture live birds to sell for the purpose of pigeon shoots. Thousands of pigeons would be released for recreational target practice. This pastime would later be adapted into the sport of clay pigeon shooting. The last major passenger pigeon nesting was recorded in 1878, in Petoskey, Michigan. By 1900 there were no longer any large flocks, and the last wild pigeon was shot in 1902 in Indiana. Multiple organizations subsequently offered rewards for any evidence of a living, wild passenger pigeon, but none would be claimed. The decline of the passenger pigeon was a catalyst for the passage of the Lacey Act of 1900, which provides for interstate regulations and prohibitions in commerce related to terrestrial fauna, fish and plants. It was the first federal law enacted to protect wildlife. Arlie William Schorger was a chemist who retired early to begin a second career in ornithology in the mid 20th century. He would become an adjunct professor of wildlife management at UW-Madison and was a colleague of Aldo Leopold. Fascinated by passenger pigeons, Schorger would travel the nation collecting eyewitness accounts and other information about the birds. His 1955 book The Passenger Pigeon: Its Natural History and Extinction is considered the definitive study about the birds and their demise. During the 19th and 20th centuries, humans caused the extinction of multiple bird species through overkill, including the great auk, Labrador duck, Carolina parakeet and quite possibly the Eskimo curlew, among others. Conservation measures motivated in part by the extinction of the passenger pigeon have helped revive the fortunes of various avian species in North America, including the trumpeter swan, wood duck, plume-bearing birds like the egret and sandhill crane, and the wild turkey. Scientists have found that the Lyme disease epidemic in the eastern U.S. has roots in the extinction of the passenger pigeon. Once the bird was no longer eating mast from beech and oak trees, an increasing availability of their nuts supported a population explosion of small rodents, particularly mice, that are carriers of the Borrelia bacteria transmitted by deer ticks and cause the disease. 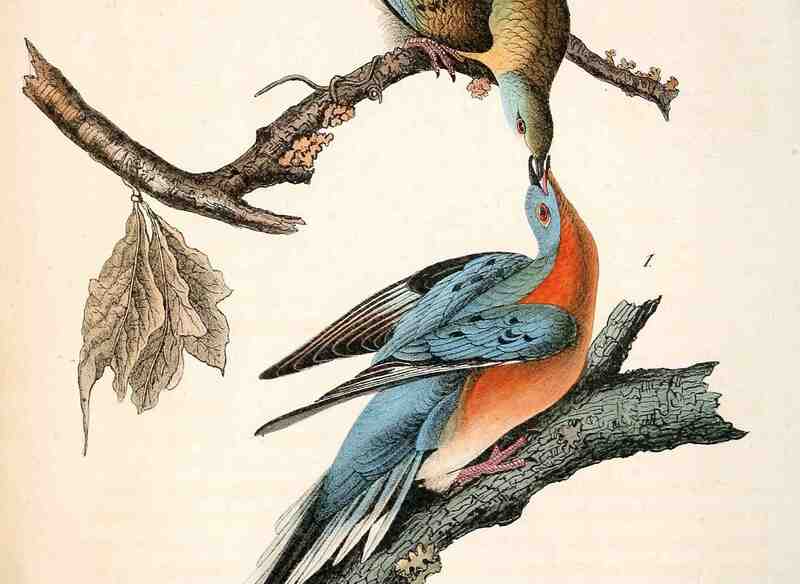 On the importance of the passenger pigeon's extinction: "[T]he passenger pigeon is sort of the ultimate cautionary tale about our relationship with wildlife. It is . . . something that we need to remember. Unfortunately, a hundred years after the fact, it is something that most people have forgotten. They don't know the story of the passenger pigeon, and they don't really understand, therefore, the significance of that tragic event for our ongoing relationship with the other creatures that share the planet with us." On the sheer numbers of passenger pigeons: "It's really hard to get your head around what it was like in the eastern half of North America when these birds were around. The estimate was that at the start of the 19th century there were three to five billion passenger pigeons. I can say that, and three to five billion doesn't mean a lot unless you have some sort of frame of reference. It meant that at that time, one bird in every four in North America was a passenger pigeon. If you lined those pigeons up beak to tail and strung them out in a row, they would circle the earth at the equator 23 times. In other words, this was a super abundant bird." On what renowned Wisconsin naturalists said of the species: "Aldo Leopold described the passage of these birds through the forest as a biological storm, that they essentially were such a huge force on the eastern deciduous forest. Our own John Muir, growing up near Portage, commented that it was a great memorable day. And indeed, that's a sentiment that was felt by many. It was certainly felt by Native Americans, and it was felt by many of the early settlers of the eastern U.S."
On the pigeons' nesting behavior: "[T]he only time they basically stayed still was during the nesting season. Just like everything else that they did, suddenly they would appear, they would decide that this was the spot, they would settle in very quickly, build a rather crude nest and lay their single egg. They got down to nesting very quickly. They nested like everything else they did, in almost unbelievable numbers. Part of the reason for this was that it was a defensive mechanism against predators. By being in a large flock, a large herd, a large school, you minimize your individual risk of being hit by a predator. So these enormous nesting colonies would form quickly, the birds would feed on the mast that had been produced the previous fall." On the market hunting of passenger pigeons: "Suddenly they were up against a predator that was unlike any predator that they had ever had to contend with in the past. Of course, the predator was us. Basically, during this 50 year period after the Civil War, almost every nesting attempt was ruthlessly pillaged by commercial market hunters who killed the birds and sold them at market. Both the adults and the nestlings were killed. They caused sure a disturbance in the nesting colonies that very few young were raised. One of the parents would be killed by the hunters, or the disturbance was just too great and the parents would abandon and leave the colony. To make matters worse, the market hunters eventually were able to track the birds year-round and continued killing them 365 days a year." On 19th-century attitudes towards passenger pigeons: "[D]uring the 19th century there were no conservation laws, there was nothing preventing people from killing wildlife at will. The national mindset was essentially, still, that that natural resources of the continent were inexhaustible, and especially something that was perceived to be as abundant as the passenger pigeon. No one could have imagined that in such a short period of time we could basically wipe them out." On why people weren't initially concerned about passenger pigeon numbers: "Probably not only was there the attitude toward the natural resources of the country, but there was also the fact that people were quite accustomed to the idea that you didn't see passenger pigeons every year. The easy explanation when they didn't show up was that they're somewhere else. You read all kinds of accounts of people basically passing this off as, the pigeons are just somewhere else. And the somewhere else really became almost absurd." On the impact of Martha's death and the extinction of passenger pigeons: "[T]he extinction of the passenger pigeon was undoubtedly the catalyst for the modern 20th century conservation movement. It inspired organizations to form, like [the] National Audubon Society. It inspired the first wave of wildlife protection laws in the country. It essentially woke the public up to this idea that the wildlife resources of the country were not inexhaustible." On the continuing role of overkilling in extinction: "[A]lthough there are these amazing comeback stories and many others of species that benefited from the lesson of the passenger pigeon, unfortunately the statistics tell us that we're still in deep trouble, and we're getting deeper into trouble all the time. As endangered species lists continue to grow, it's somewhat tragic that in addition to things like habitat loss and ecosystem stresses like climate change and invasive species, that there are still substantial numbers of endangered species that are endangered because we're overkilling them, that we still haven't gotten over that most brutal form of causing a species to go extinct." There is a 250-page book on passenger pigeons by English naturalist Mark Avery.